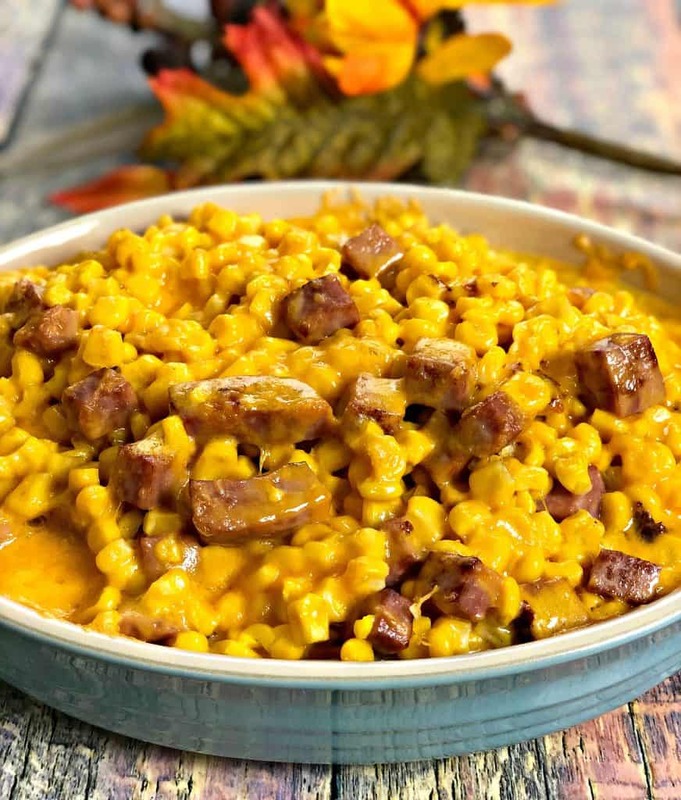 Instant Pot Jack Stack Baked Creamed Cheesy Corn is the perfect recipe to satisfy my craving for one of my favorite BBQ side dishes. I live in Kansas City. We indulge in BBQ OFTEN. One of my favorite restaurants is Jack Stack, which is local to KC. 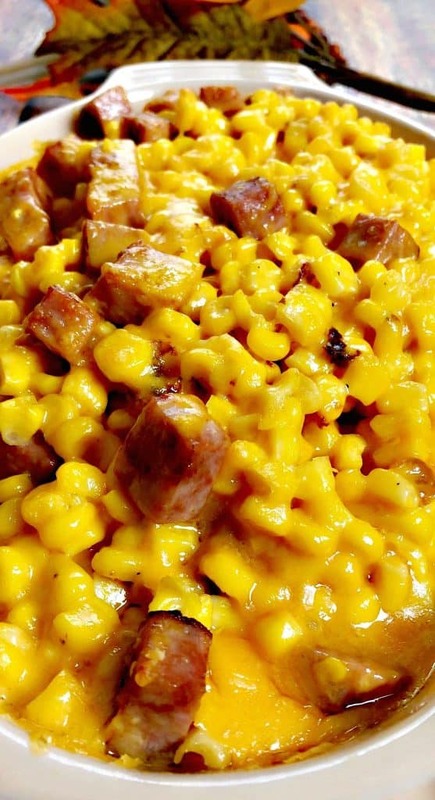 Their most popular side dish is their cheesy corn bake. It is absolutely perfect! I have been living in Kansas City for almost 10 years now. It seems so crazy that much time has passed! I can vividly remember my first moments in the city. It was really tough to learn my way around in a totally new environment, make friends, etc. Finding great BBQ to enjoy was not tough. I frequented all of the well known local spots. I wanted to come up with my own favorites. Everyone has their own personal list and rankings of which restaurants are the best. The cheesy corn at Jack Stack always stood out to me. For this reason alone, Jack Stack will always be on my personal list for best KC BBQ. We can argue until the cows come home about which restaurant is #1. That is a conversation reserved for another day. Of course, cheesy corn pairs wonderfully with BBQ meats, but it will also make an amazing side dish for most meals. I decided I wanted to make my own dish at home this year for the upcoming Christmas holiday. With a few modifications, I was also able to lighten up the recipe some without manipulating the great taste. 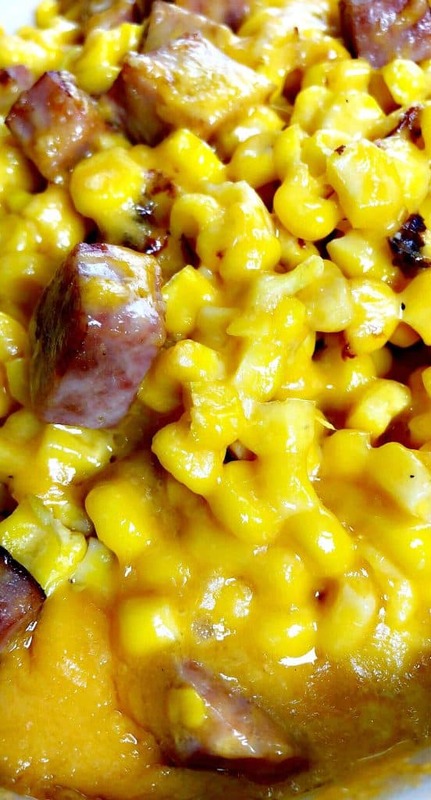 This dish is definite comfort food. Using reduced-fat products, almond milk vs whole milk, etc really goes a long way in terms of slimming down the recipe. Don’t have an Instant Pot or pressure cooker? You can make this dish in a slow-cooker or on the stove and follow up with baking. 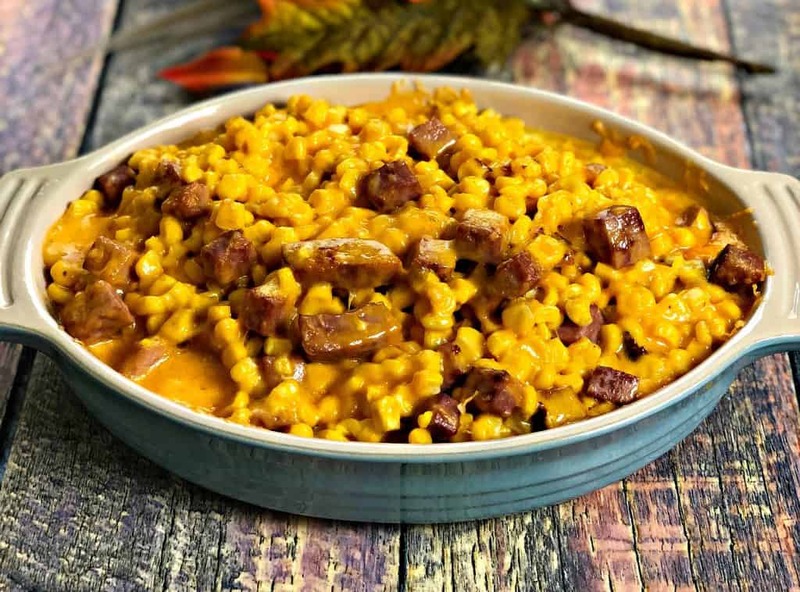 Instant Pot Cheesy Corn with Ham is a Fiorella's Jack Stack BBQ cheesy corn bake casserole copycat recipe with diced ham perfect for cookouts and holidays. Turn the Instant Pot on the Saute function. Add the olive oil and cubed ham to the pot. Cook for 2-3 minutes. Add the corn, 1 cup of cheddar, cream cheese, broth, seasonings, butter, milk, and whipping cream to the pot. Close the lid on the pot and seal. Stir to combine. Cook for 8 minutes on Manual High-Pressure Cooking. Allow the steam to release naturally for 5 minutes instead of quick release. Combine the water and flour in a small bowl to create a slurry. Pour the flour slurry into the pot and stir. The mixture should thicken. Place 1/2 of the cheesy corn in a casserole dish. Place the cheddar cheese chunks throughout. Sprinkle 1/2 of the shredded cheddar throughout. Top with the remaining cheesy corn. Sprinkle the remaining shredded cheese throughout. Bake in the oven for 5-8 minutes until the cheese bubbles. Looks amazing! 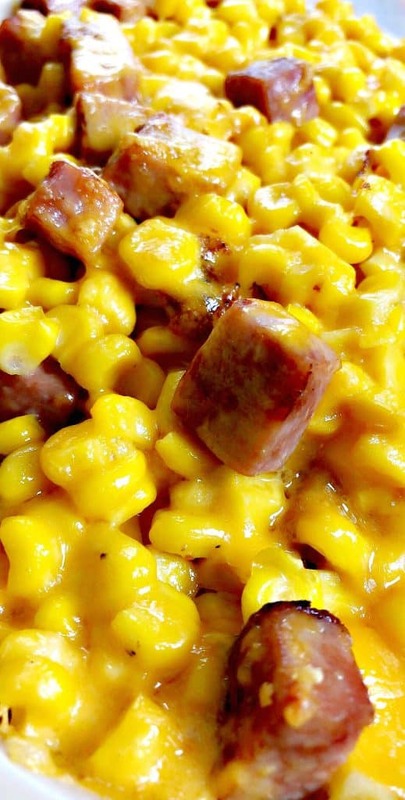 Cheesy corn and ham? What a perfect combo! Yum, this looks so good. I’ll be making this for dinner soon. I always like when I can use my Instant Pot! Wow! This sounds delicious: absolutely a comfort foodie’s dream. Speaking of Instant Pots….I’ve got turkey soup cooking now! Love that this is a healthier version of such a comforting dish, without losing any of the comfort factor! Definitely one for winter! I consider this an act of war against my thighs. HA! Comfort foods will do that! Portion control is key, but so hard. This corn is really cheesy love the addition of Ham. I have instant pot only tried few dishes with it. 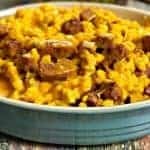 Look like you have lot of recipes using Instant pot. I will check it . Hmm, cheese, corn, and ham! Can’t get any better. I really need to get an instant pot. Ooh it looks so creamy and delicious! I just ate and still want some of this in my belly!! This looks so delicious. I love how cheesy it is and the addition of ham makes it so good. I have to give this recipe a try. I can’t wait to try this. I love the addition of ham! 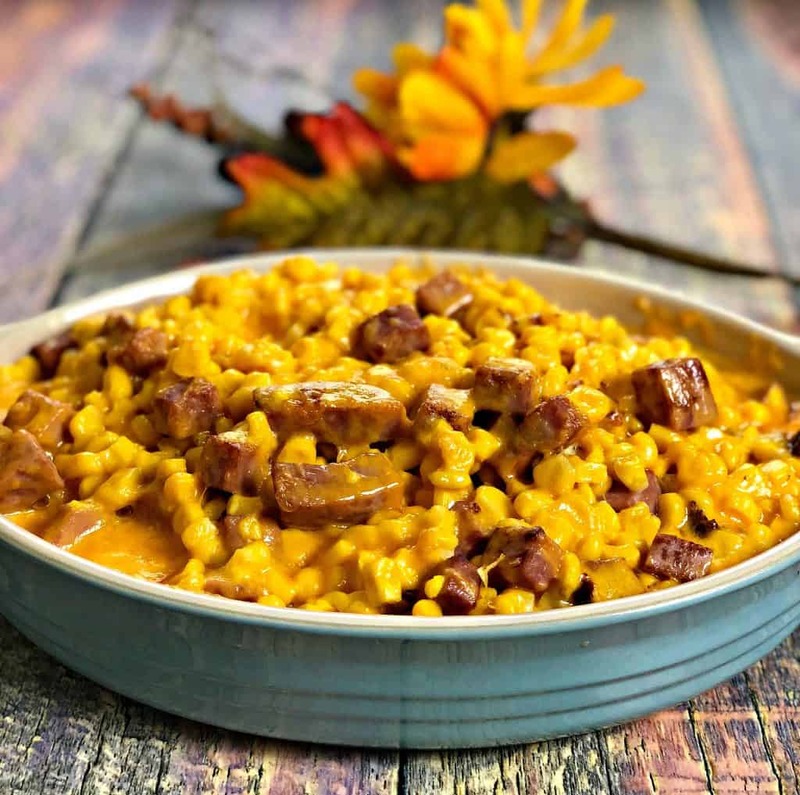 I am going to have to try this one soon, I am a huge fan of corn and cheese but you just blew my mind by putting them together in an instant pot! Awesome! I Hope you try it and enjoy! This looks so good! I would have never thought about putting those flavors together. My hubby would love to try this. It sounds good minus the ham. Cheesy corn?!?! Yes, sounds delish. I love cheese and corn and neber thought about having them together. This INSTANT POT BAKED CREAMED CHEESY CORN WITH HAM looks so good! So yummy and tasty! Oh gosh this sounds delicious! I love cheese and corn and have never mixed them together! That recipe looks delicious, and something that my boys would probably eat too! Now I just need to get an instant pot so I can make all these scrumptious meals! That looks so tasty! My husband loves cheesy dishes. This would be right up his alley. Thanks for sharing such a delicious recipe! That is definitely my kind of comfort food!! omg this sounds delicious! I’ll have to save this recipe for later! This looks like it is so tasty! I love simple meals like this that are packed with flavor. What size bags of corn did you use?